Stay at the beach in comfort and style! Your family's new beach house!! Considering taking a Tybee Beach vacation? The amount of Tybee Beach rentals might look overwhelming at first, but here at Southern Belle we can help you narrow down the perfect selection of Tybee Beach condos for your vacation. One of our many Tybee Island rentals, South Beach Retreat is only steps away from the South End beach. With accommodations for four guests, it fits a Tybee Beach vacation for a family or a small gathering of friends. The house has two bedrooms, two baths, a front balcony, washer and dryer, Wi-Fi, all linens and space to park two cars. Walk into the Tybee Island rentals South Beach Retreat and experience the light and bright living and dining room, framed by the white-themed kitchen. 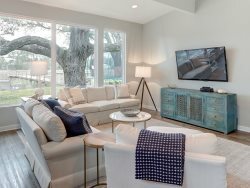 The living room has plenty of seating for four, a ceiling fan above to keep things cool and a flat-screen TV for catching up on your favorite shows. The dining room has a table for four, but four bar stools and a kitchen bar are perfect for more entertaining. The kitchen has all the requisite appliances, including a coffee pot, plenty of counter space and a double sink. The bedrooms are roomy and designed in a relaxing shade of green. Both bedrooms look out over a front balcony area and have ceiling fans. The front balcony stretches to in front of the living room as well and a patio table provides outdoor chill-out time. What to do on your Tybee Beach vacation. There's plenty to do near Tybee Beach rentals and best of all, most of it is within walking distance. Tybee Beach condos are ideally located on the 2.7 square mile expanse of Tybee Island. Visit the Tybee Beach lighthouse and museum or Fort Pulaski for some Civil War history. Of course, the beach and plenty of water activities are just steps away from all Tybee Beach condos. Jennifer was very responsive to questions and issues with our stay. Very professional, courteous and friendly! Beautiful property convenient to activities, beach and eating.